THE STORY - When slick sports agent Jerry Maguire (Tom Cruise) has a crisis of conscience, he pens a heartfelt company-wide memo that promptly gets him fired. Desperate to hang on to the athletes that he represents, Jerry starts his own management firm, with only single mother Dorothy Boyd (Renee Zellweger) joining him in his new venture. Banking on their sole client, football player Rod Tidwell (Cuba Gooding Jr.), Jerry and Dorothy begin to fall in love as they struggle to make their business work. THE GOOD - A trio of good performances with memorable writing by Cameron Crowe. THE BAD - Romantic plot remains clunky and the film does run a tad bit too long. There is no way you have not heard at least one line from "Jerry Maguire" uttered in your normal everyday life. From lines such as "You complete me" to "You had me at hello," there is a reason that audiences have always kept on coming back to Cameron Crowe's film. The easy answer is that it is a light crowd pleaser that managed to appeal towards both males with its insight into the world of sports management (In this case, within the sport of football) and women with its romantic story of a down on his luck guy and the woman who could be the answer to all of his problems. The film may not succeed in hoping to cover all of those areas (And it certainly tries to with a nearly two and a half hour running time) but it has remained popular all of these years regardless of its flaws. Jerry Maguire (Tom Cruise) is on top of the world. He is a sports agent for SMI (Sports Management International) with over 70 clients who he works for around the clock every day. His world is one of smiling, smooth-talking, hand shaking and lots of motivational speeches. After realizing that his true purpose for becoming a sports agent (Personal relationships with his clients) is in danger of becoming lost, he writes a mission statement that calls for change within SMI. "Fewer clients, less money" is the statement that sticks out the most. After distributing it to everyone at work, his life slowly begins to fall apart. He is fired from his job, loses his fiance, loses most of his money and loses most of his clients. However, one client, a wide receiver for the Arizona Cardinals named Rod Tidwell (Cuba Gooding Jr.) decides to stick with him. They are joined by Dorothy (Renee Zellweger), a single mom who works in accounting at SMI. She decides to drop everything and follow Jerry Maguire out of SMI with their one client because she believes in his mission statement, and may possibly even have a crush on him. 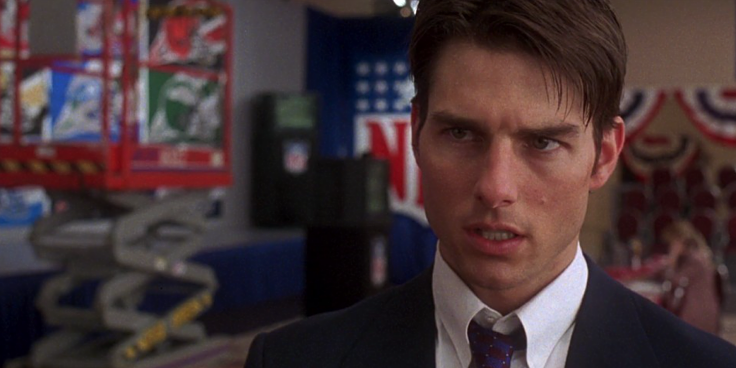 "Jerry Maguire" is a film all about belief. However, not belief in the religious sense. It's about belief in one's self, one's ability, and belief in the power of love. Jerry Maguire needs to believe that he can bounce back from this tremendous roadblock that has been put in front of him in his life. Rod Tidwell needs to believe in his love for the game of football in order to inspire his team to renegotiate his contract towards a better deal (He has quite a few personality issues). And Dorothy needs to believe that Jerry Maguire can overcome his own insecurities, and his own troubles so that he can be there to provide a good life for her and her son. It's this stance on 'belief' that "Jerry Maguire" finds its charm and continues to entertain viewers till this day. It's an uplifting message that makes the audience feel good knowing that if they too can believe in something as strongly as these characters do and how they all help each other to get there, that we too can achieve happiness. The film would simply not work without the performances of its cast. Sure, the writing is inspiring, smooth and a good deal of fun. But it's the committed performances from the three leads that help to sell it. Tom Cruise does his best Tom Cruise here. He's perfect for this role as he's somewhat playing a version of himself dialed up to 11. He conveys the highs and the lows of this character with an unmatched charisma that is easy to grab onto. Renee Zellweger plays Dorothy with a vulnerability and charm that instantly makes her likable. She's not perfect in any way, but she takes hold of the situation she has been dealt and at times emerges as a stronger character than Jerry Maguire. Cuba Gooding Jr. won the Best Supporting Actor Oscar for his performance of the hot-shot football star with an attitude problem. His performance is ironically the weakest of the three but you can't help but be won over by his exuberance in his scenes with Tom Cruise. The romantic subplot may not be as captivating as the glimpse into the world of sports management but it's Cameron Crowe's genuine script that has helped "Jerry Maguire" to live on all these years later. How can you not be won over by its memorable dialogue such as, "You had me at hello" and its trio of terrific performances? While the film may feel a little rushed towards the end, it manages to stick the landing and ends on a high note, all the while providing Tom Cruise with one of the best roles of his career. Some actors may have coin, but Cruise certainly has the "quan."